Abdul Khoza is a South African actor best known for winning the second season of the SABC1 reality competition Class Act, in 2011. After winning Class Act he left his job as a fireman in Durban and moved to Johannesburg to pursue a career in acting. He also served four years in the army before he became a firefighter. In 2013 he landed his first starring role as Two Step, a rising soccer star who lives in the dappled suburb of Parktown with his fiancée, in the second season of the SABC1 drama series Intersexions. He is the son of Stan Khoza, the Independent Municipal and Allied Trade Union national president. 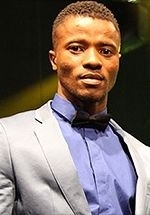 His brother is television presenter Sthembiso "SK" Khoza.